APP36-07 ISLAMABAD: May 07 - Prime Minister Shahid Khaqan Abbasi with organizers of "International Maritime Symposium". Chief of Naval Staff Admiral Zafar Mahmood Abbasi, President AJ&K Masood Khan and National Security Advisor Lt. Gen. (R) Nasser Khan Janjua are seen in the picture. APP. ISLAMABAD, May 7 (APP):Chief of the Naval Staff, Admiral Zafar Mahmood Abbasi NI(M) on Monday said that Pakistan Navy had formulated robust employment and development strategies to safeguard national maritime interests despite the numerous challenges. He said this while addressing the International Maritime Symposium (IMS-2018) titled “Impact of BRI on the Geo-economics of the Indian Ocean Region (IOR); Prospects for Pakistan, the Region and Beyond” organized by the Institute of Maritime Affairs (IMA) here at Bahria University. Prime Minister Shahid Khaqan Abbasi addressed the inaugural session of the symposium as chief guest. Reputed national and international speakers participated in the event. The Chief of Naval Staff in his inaugural address, while discussing the symposium’s theme, said that the subject was deep rooted in the remarkable trade history of the region, which had transcended various races, cultures and religions. In the 21st Century, the conceived ‘Economic Networking’ through Belt and Road Initiative would not only help to revive historical links but also contribute towards economic prosperity of the nations renewing transcontinental trade routes connecting Asia, Africa, Europe and even beyond, he added. While highlighting the significance of Indian Ocean (IOR) the Chief of Naval Staff said that IOR has been the global geo-political chessboard and one of the core drivers of world’s prosperity. However, over the past few decades, it has witnessed seismic shift at the geo-strategic level. While this shift was initially security focused, the Belt and Road Initiative was an attempt to transform it into geo-economics, he added. In this context, the Chief of Naval Staff said the BRI including the flagship China Pakistan Economic Corridor (CPEC) project, promised huge investments, economic development and consequent socio-economic empowerment of the poverty ridden masses of the region. Nonetheless, BRI will have profound regional and extra-regional implications as it has drawn attention for competition, influence, economic gains and security interests, he added. The Chief of Naval Staff said integrating more and more countries and forging their stakes through an open, coordinated and inclusive arrangement however, would contribute towards a more conducive and stable security environment based on the principles of positive gains for all. He highlighted that they were passing through a momentous era for the maritime landscape of Pakistan. The developments of the recent past specially the CPEC have catapulted this domain to the fore-front of our national agenda. It has, therefore, become imperative to undertake integrated development of the maritime sector so as to be able to contribute meaningfully in overall economy of the country, he added. The Chief of Naval Staff said that with the exploration and better utilization of marine resources, Pakistan can greatly expand its economy. The government is taking all possible steps to develop the maritime sector which will contribute significantly to Pakistan’s economy, he added. While discussing the security dimension of BRI and CPEC, and the ensuing expansion of maritime economic activity, he stated that they ought to be cognizant of the traditional and non-traditional security threats that necessitate effective security, proactive diplomacy, well considered economic policies and risk management as important ingredients to exploit and sustain the pace of development and potential growth. 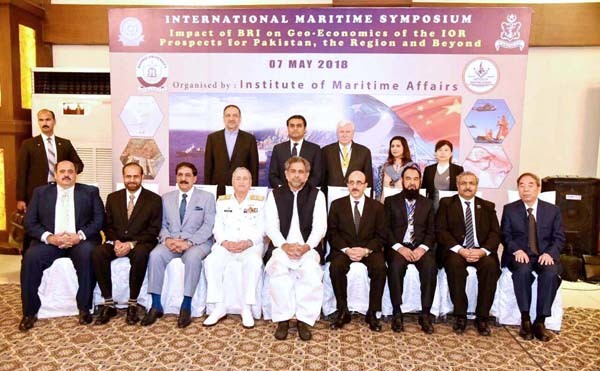 With regards to BRI implications in IOR, shift in strategy and boost in economic growth of region, Director General Institute of Maritime Afairs (IMA) said the theme of this symposium offered the opportunity to have in-depth analysis of the globally discussed Belt and Road Initiative (BRI). Although, the subject was mainly focused on the Geo-economic implications of BRI for Indian Ocean Region, the project was widely considered as an initiative which bears the potential to transform global geo-political environment as well. BRI was a shift in strategy to integrate China with the rest of Asia, Europe and Africa, and in the process, build infrastructure across these regions to boost economic growth of the region. China-Pakistan Economic Corridor (CPEC), flagship project of BRI, will give impetus to the economic progress and prosperity in the IOR and beyond, he added.